Any recommendations for what you can do about mice problems should begin with an apology to computer mice – useful tools that rarely cause headaches and are so loved that we give them their own pad. 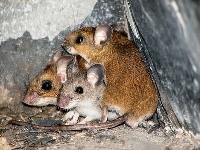 No, we’re talking about the vermin kind of mouse now – the ones you know you have in your home if you spot tiny droppings on the floor, see small holes in food boxes or hear sounds in walls. Fortunately, these mice problems can be solved safely and effectively in ways that will get rid of the critters now and keep them out in the future. The first step is to stop inviting mice over for dinner. Eliminating all of their easy and not-so-easy food sources will discourage them from turning your home into a rodent buffet. Start by throwing out trash more often and by keeping it stored in containers with tight lids. Store all non-refrigerated food products in plastic containers – from cereals to baking goods to pastas – in short, everything. After emptying cardboard boxes into mouse-proof containers, cut the label off the box and tape it on the container so you remember what’s in it. Don’t forget pet foods – store them in containers, start picking up food when your pets are done eating and clean their bowls thoroughly. When the family is done eating or snacking, clean up crumbs immediately and wash the plates or put them in a closed dishwasher. Don’t leave any foods on counters or tables, clean up spills and crumbs immediately and get everyone in the habit of eating at the kitchen or dining room table. Next, shut down the mouse motels. Clean, vacuum and disinfect all areas where you find evidence of mouse activity. Remove piles of clutter in bedrooms, basements and garages that give mice cozy dark areas to hide, sleep and build nests for more mice. Make sure you look around outside the home for trash or woodpiles where they might be living. Once you’ve eliminated the clutter, close all the ways mice can get in. Look for holes in walls, especially in places where wiring or plumbing pipes are already going into your house. Use caulk, cement, metal mesh, steel wool and other mouse-resistant materials to seal the entry points. Focus on the floor since most mice can’t climb very high. Finally, get rid of the mice that just won’t leave even though you’ve removed their food and shelter. There are many effective mouse repellents in the form of sprays, pellets and even electronic devices that emit sounds humans can’t hear but can drive mice away. Mouse traps take two basic forms – those that kill or trap the mice so you can kill them and those that catch them in a cage so they can be released far away from your home. Both work – it’s up to you to decide which is preferable. Poisons are also effective but must be used with extreme caution around children and pets. For larger mouse problems, especially when they infest walls, it’s best to use professional exterminators to remove them quickly and avoid the distasteful problem of dead mice decaying in hidden areas. Clean, close and collect – do those things on a daily basis and your mice problems will soon be back out in the wild where they belong.